Unless you have been living under a rock, there is no way that you haven’t heard about aloe vera and its umpteen benefits. 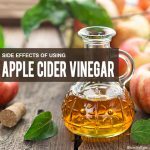 Whether you take it in its natural form or in its juice form, there are scores of benefits to gain from it. And you will find almost every beauty and health blog singing praises of this miraculous product. It is also not surprising to see various DIYs and tutorials on how to use aloe vera for various purposes. However, this post is slightly different from all the posts. Why? Because in this post we would be talking about the side effects of aloe vera juice! Surprised? Well, just like every other natural product out there, aloe vera also comes with its own set of side effects. 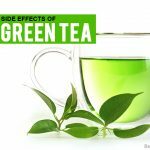 Now whether those side effects are harmful or just precautionary measures is something that you will find out by the end of this post. Before we begin with the crux of this post, let us quickly give out information about aloe vera. Aloe vera is basically a cactus-like plant which has two different substance – gel and latex. While the gel is a jelly-like substance which is clear and found in the inner part of the aloe vera plant’s leaf. The latex is yellow in color and is found right under the sin of the plant. Aloe vera is used for both cosmetic as well as medical purposes. Aloe vera can either be taken by mouth or by applying it on the skin. Read on as we list down the side effects of aloe vera juice. So if you are among those who have been consuming, go ahead and read the side effects of the Aloe Vera Juice before you drink it anymore. People who have diabetes need to be extra cautious while consuming aloe vera juice. The reason behind this caution is that aloe vera can cause the blood sugar levels to go down. So if you are consuming it, then do monitor your blood sugar levels on a regular basis. Because of its interference with your blood sugar levels, it is suggested to stop using aloe vera juice at least 2 weeks prior to a scheduled surgery. This is to ensure that your blood sugar levels are in control both before and after the surgery. There have been cases reported regarding kidney failure and other serious disorders due to the consumption of high doses of aloe vera latex. The overdose of aloe vera juice can also result in the build-up of blood in the pelvis area. Taking aloe vera in either of its form – gel or latex can prove to be fatal for pregnant women. It has been reported that miscarriage is another side effect and there can also be some birth defects. So pregnant women should just avoid aloe vera juice completely. Women who are lactating should also completely avoid consuming aloe vera juice since it contains certain irritant and purgative agents. So keep yourself and yur baby safe by staying away from aloe vera juice during your breastfeeding period. The latex content present in aloe vera juice is quite harmful and can cause some serious problems like hemorrhoids. Consuming it can make your condition worse. Products which are made from aloe leaves will contain certain amounts of latex. This aloe vera latex can cause bowel irritation and hence needs to be strictly avoided if you have any of these intestinal problems – Crohn’s disease, ulcerative colitis, or obstruction. Though applying aloe vera gel on a child’s body is safe, consuming it by mouth in the form of aloe vera juice is deemed unsafe. The extracts of whole aloe leaves and aloe latex should be kept away from children. There are people who might be allergic to aloe vera. If you are allergic and have consumed it then you might get affected by skin rashes. People with bleeding disorders should take notice of the fact that consuming aloe vera juice might result in aggravating your bleeding disorder. If you do notice an increase, then you probably need to adjust your dosage. The consumption of aloe vera juice should be monitored closely in people who have hearts disorders or electrolyte abnormalities. Whether you use it as a laxative or consume it by mouth, you need to be extra cautious. Diarrhea is another side effect of consuming aloe vera juice. This side effect can occur due to couple of reasons like the quality of the aloe vera juice, over dosage of juice, extra additives present in the juice, etc. If you are on some specific medications, then you need to talk to your doctor before consuming aloe vera juice. The laxative present in aloe vera can interfere with certain medications because of which you will not be able gain the complete effect of the prescribed drugs. Vomiting is a condition which can occur due to a number of reasons. So you need to be doubly sure that if you are feeling nauseous then it is a side effect aloe vera juice and not something else. It would be ideal to stop consuming the juice if you are vomiting because of it. Sometimes when you leave the aloe vera juice exposed for too long, it will go off. This is another side effect which is common to a lot of other problems. So just ensure that it is actually a side effect of drinking aloe vera juice and only then you need to stop or reduce the dosage. We hope you will keep all these side effects in mind the next time you want to consume aloe vera juice. Anything done in the right measure is always helpful for our body and it turns harmful only when you don’t follow the right instructions. So take care and follow the right dosage! How to Cure Sunburn with Aloe Vera? 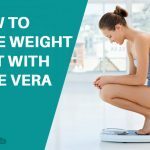 Can Aloe Vera Help Lose Weight? 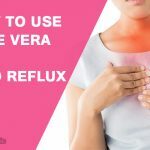 How to Use Aloe Vera to Treat Acid Reflux? 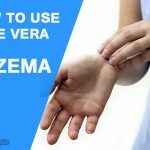 Aloe Vera for Eczema: How to Use? This post is slightly different from all the posts. Why? 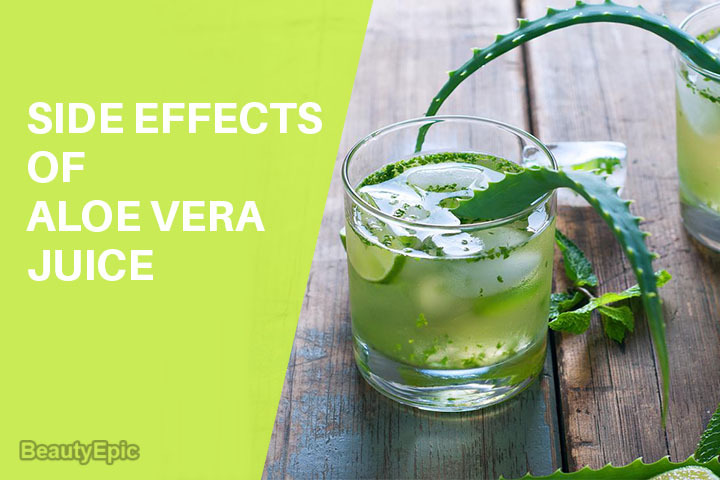 Because in this post we would be talking about the side effects of Aloe Vera juice! Surprised?